The 36IB provides sensible and latent cooling with a drain pan, allowing installation where chilled beams were not previously a good fit, according to the company. The unit's design enables the use of low chilled water temperatures. 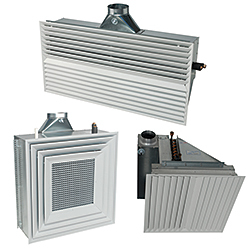 An induction beam system requires smaller volumes of ducted air, enabling fan power reductions for the central air handling equipment, which is only needed for building ventilation.